After just learning that only one original cast member from Jurassic Park would return for the developing sequel and pseudo-reboot Jurassic World, it looks like a rumor that has been swirling for awhile has finally been confirmed thanks to some concept are that has surfaced online. 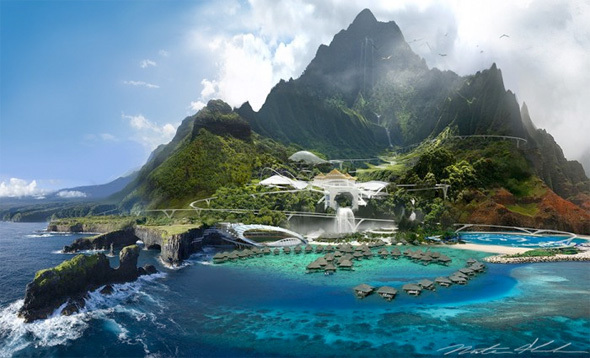 Last fall when the title and 2015 summer release date was revealed, we reported a rumor that the new film would be set in present day Isla Nublar, where Jurassic Park is now an actual attraction (likely called Jurassic World), as originally intended by John Hammond. It garners 10 million visitors per year and is completely safe – until it’s not. 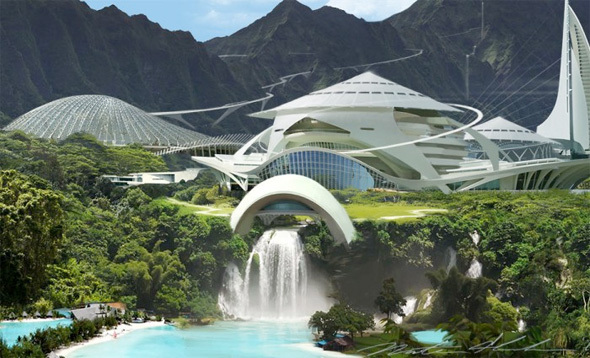 Now two pieces of concept art seem to confirm that, showing off an impressive island-wide theme park. Look below! The concept art comes from The International Business Times (via ScreenRant), who found the pieces in the online portfolio of Nathan Schroeder, who also worked on The Avengers, Star Trek Into Darkness, Dawn of the Planet of the Apes and The Hunger Games: Catching Fire. As you can see, that's one hell of a theme park, and seems to massively improve upon John Hammond's original plans. After all, 22 years will have gone by since Jurassic Park in 1993, so technology has certainly gotten better, which means we should be able to keep these dinosaurs in check much easier, right? Taking a look around, there seems to be a monorail system running through the park rather than the Explorers on an electric track, and the park certainly looks finished and ready for visitors. But maybe the film takes place during a test run of the park, just like the original, but with a much bigger crowd (theme parks are known to do that before they open). Now since this is concept art, the final design might not look exactly like this, but the fact that this kind of work was commissioned still keys us into our setting for the film. A massive setting like this, especially with plenty of tourists, will certainly change the game a bit, and should make for a rather interesting sequel in this adventure franchise. Sound good? Whoa. That looks awesome. Can't wait! Neat. Can't wait to see it covered in raptors. I purposefully read the first paragraph without seeing a glimpse of the new concept art because I was too excited to be spoiled with any glimpses of the images. Seeing them now, I'm SOOOOOOO stoked with the direction this film is going in. Being a zookeeper myself, even if this film didn't have the dinos wrecking havoc on the park, just having this movie based on a successful, thriving Jurassic World would be great enough for me! Life will find a way... to wreck this place!